Citizen this week adds another notch in its already impressive list of light-powered watch achievements. Citizen debuts the new Citizen Eco-Drive Professional Diver 1000M, effectively the first light-powered watch that function this deep (1,000 meters). 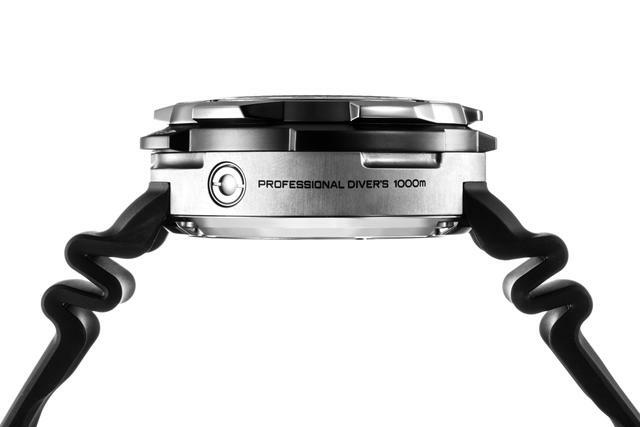 The firm’s extensive research and development department (which we reported on here: Citizen says the new watch, which enters Citizen’s ProMaster lineup, has been tested to perform in true deep dive situations (saturation diving), which means the watch will handle the pressure at that depth while remaining fully visible and functional on the wrist. 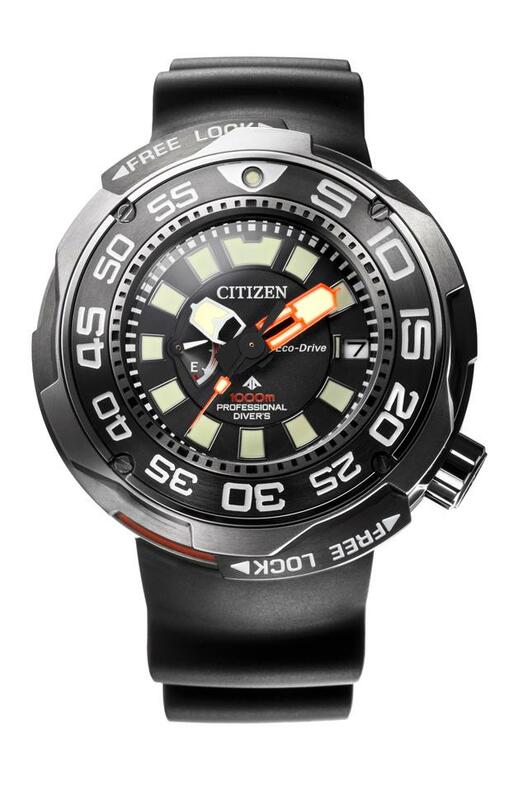 Citizen diver watches, typically rated to 200 and 300 meters, have long been a favorite choice for many divers. For this newest model, Citizen has more than doubled the amount of butyl rubber it uses for gaskets in order to enhance the water resistance rating for the Eco-Drive Professional Diver 1000M. 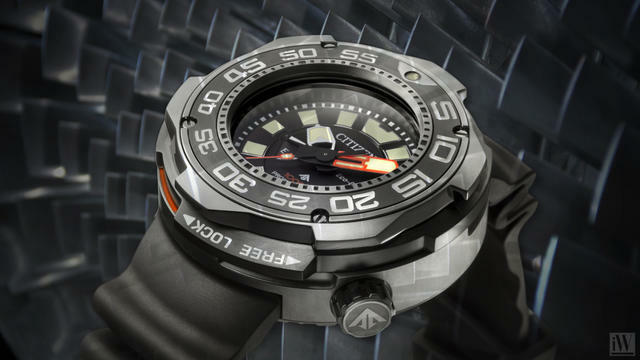 The watch is also a bit larger (52.5mm in diameter) than most Citizen dive models. The larger size gives the designer a bit more tolerance when creating a stronger crystal, crown and air release valve. Citizen explains that it tests each watch for fifteen days in a pressurized chamber that contains helium gas in order to ensure that when the diver surfaces the watch will continue to maintain its accuracy and water resistance. This testing is done with the assistance of JAMSTEC, Japan’s marine science research agency. Citizen makes the watch’s case using its own proprietary titanium material called Super Titanium, which it then coats with a surface hardener called Duratect MRK. Citizen says this treatment improves not only the scratch/wear-proof feature but also the shock resistance. Citizen has overhauled the entire structure of the rotating bezel to improve the stability of the timer function and added a lock mechanism to the bezel to insure unidirectional timing is not affected by sudden movement. The index and the large minute/second hands on the dial features a new luminous paint with stronger afterglow. When the bezel lock is set to FREE, the orange warning color is shown to warn the owner that it is unlocked. The crown also has a similar mechanism, revealing an orange color between the case and the crown to tell the owner when the crown is not pushed into a lock mode.